Like Elizabeth Warren, Washington’s hysterical obsession with Russia is persisting. At least a year old, it’s showing no signs of fatigue. Russia is essentially accused of not particularly liking Hillary Clinton and digging up some “kompromat” on her, which, unlike Trump’s “dossier”, also happened to be undeniably true. This material compromised Hillary by using her own words and those of her closest advisors to expose her as careless, entitled, and mostly dumb, incompetent beyond measure. Combined with the mood of the electorate after eight years of Obama and Trump’s hardworking campaign and popular messaging, this material found an audience among regular folks who, unlike Hillary, face consequences when caught flouting the rules. In short, she lost. This should have been the end, but it wasn’t. Russia persists as an obsessive focus of the American establishment. Its pushback against American interests in the Middle East and Eastern Europe, its “thuggish” way of dealing with internal opposition, join the election “meddling” to drive batty a bipartisan coalition of senators, congressmen, and pundits. It is perhaps unfortunate that not a single member of this exalted coalition, riddled as it is with post-graduate degrees and bullet-proof bona fides, bothers to ask the question: Why is Russia doing all this? Russia is a country in deep crisis. It hasn’t had a truly legitimate form of government in over a hundred years since the fall of the Romanov dynasty. Its industrial base beyond the defense and energy sectors is virtually non-existent. Its population is drinking record amounts of methylated spirits and suffering the consequences. Its birthrate is plummeting and its life expectancy is far below that of any developed country. Why would a state with such a full slate of existential domestic problems invest so heavily in projecting its influence on the world stage and more specifically in opposing the interests of the USA? To answer this question one should look no further than what is happening right now in Moscow’s Red Square. For the past couple of nights the square comes to life with dress rehearsals for the massive military parade scheduled for the Victory Day holiday of May 9th. This holiday commemorates the taking of Berlin and specifically the Reichstag on that day in 1945 and the final defeat of Nazi Germany at the hands of the Soviet Union. The war that precipitated this event is known in the West as World War Two. But not in Russia. In Russia this bloodiest of all conflicts has a different name; it is called the Second Patriotic War, though that is a mistranslation. Vtoraya Ot’echestvennaya Voina is not an easy concept to translate. As good approximation as any would be The Second War for the Defense of the Fatherland. But wait a minute, isn’t any war a war for the defense of the fatherland? The answer is apparently no if your fatherland occupies a full one sixth of the planet’s landmass. Russia is so vast, and has been so vast for so long, that most armed conflicts do not come close to threatening its existence. Most of Russia’s wars were fought for influence (Poland, Finland, Baltics), access to resources (Siberia, Central Asia, the Caucuses), or access to warm year-round ports (Ottoman Empire, Britain, France). None of these conflicts put at risk the existence of Russia as a sovereign polity. But there were two that did. When Napoleon invaded Russia in 1812 at the head of a half-million strong Grande Armee comprised of French and Western European troops he intended to force Tsar Alexandr I to accept his Continental System designed to isolate and bring to heel his real enemy – Great Britain. In order to do that he needed to win one decisive battle against the Tsar’s army and annihilate it; something that he had previously done to the Austro-Hungarian Empire and Prussia at Austerlitz. 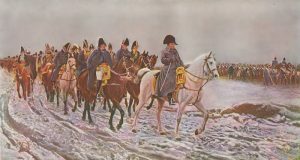 To Napoleon, this expedition was the continuation of politics by other means; a forceful maneuver, not designed to subjugate Russia, but rather to change its political calculus. But that was not how the Russians saw it. They saw Napoleon as a usurper to the throne of France that was only a couple of decades previously bloodily vacated from its legitimate Bourbon rulers. And they perceived Napoleon’s uninvited entry into the Russian heartland as a direct threat to their survival as a sovereign nation under a God-anointed sovereign King. As a result, the Russians under the brilliant command of General-en-Chef Kutuzov avoided giving the French any major battles except one, the Battle of Borodino. In that battle the Russian Army stood its ground, inflicting major casualties on the French and fighting them to a draw. Exhausted, Kutuzov withdrew his forces, whose preservation he saw as the ultimate goal, from the battlefield and yielded to the French the ancient Russian capital of Moscow. 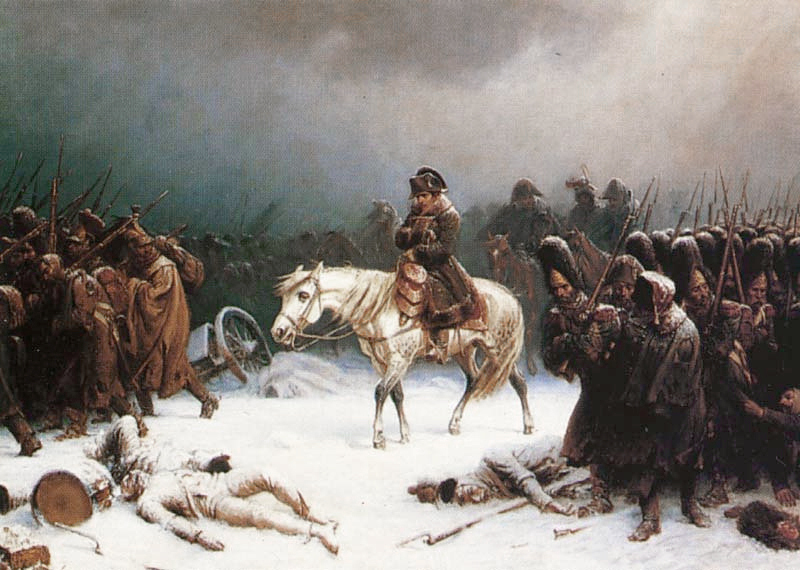 Unable to resupply, with the Russian villagers fully in support of their Sovereign, Napoleon had no choice but to start his withdrawal back to France in the midst of a brutal Russian winter. Kutuzov’s army nipping at his heels all the way to Paris, Napoleon lost an astounding 90% of his personnel, returning to France with only fifty thousand men. Tsar Alexandr entered Paris in triumph, an event we commemorate every time we use the word “bistro”. Russian kozaks, stationed in Paris were not known for their patience and likely lacked an appreciation of the finer points of French cuisine, leading them to yell “bystro, bystro” (quick, quick) at the French inn-keepers. And thus were born the first fast-food establishments, the bistros. 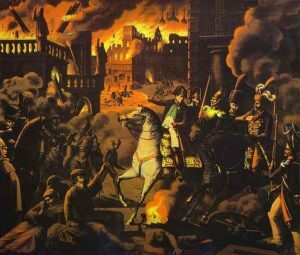 It is important to realize that already at that time Russia’s perception of the Napoleonic Wars sharply departed from how they were viewed in the West. Westerners are taught that, as Abba so succinctly put it, the Napoleon “did surrender” in Waterloo, modern Belgium. Conveniently omitted from this narrative is the fact that Waterloo was Napoleon’s second coming. After his defeat at the hands of the Russians, he was exiled to Elba, an island just off the coast of Italy. This geographic proximity to Europe and a power vacuum in France, allowed him to escape, return to France, and reestablish an army. However, this army was but a shadow of the Grand Armee of pre-Russian invasion vintage and its defeat at the hands of Wellington’s coalition of Western European powers was both quick and inevitable. In the Russian narrative, Napoleon was a scourge on all of Europe, a byproduct of the miasma that was the French Revolution, and it fell to Russia to rid the world of this menace. It was Russian lives, Russian treasure, and Russian military prowess that defeated Napoleon, not Wellington. 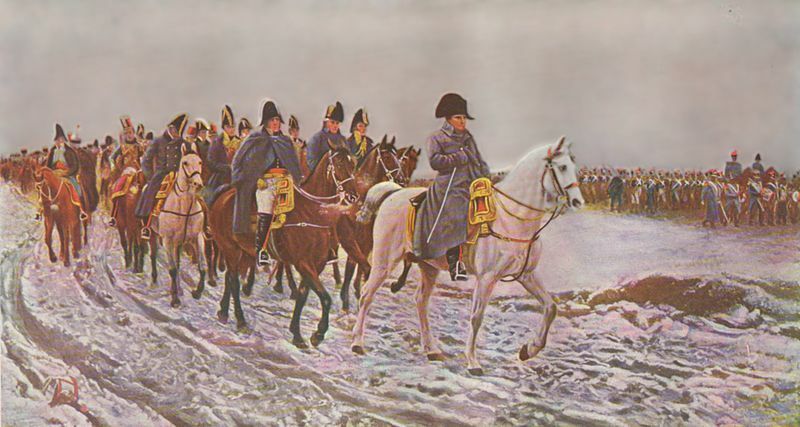 Napoleon did surrender, but to Kutuzov in Paris, not to Wellington in Waterloo. So yes, the Napoleonic invasion in which Russia had to concede its ancient capital, was the First Patriotic War. It is the uncontested Russian view that Hitler’s invasion of Russia in 1941 bears direct resemblance to the Napoleonic invasion 129 years prior. Once again, a major Western European power, assisted by auxiliaries (Italians, Hungarians, Romanians) posed an existential threat to Russia’s sovereignty. Once again, the accounts of how the war ended differ sharply between Russia and the West. In America, it’s D-Day and Omaha beach. It’s the Battle of the Bulge and Patton’s daring dash to rescue. For the Russians, and with good reason, none of this mattered. 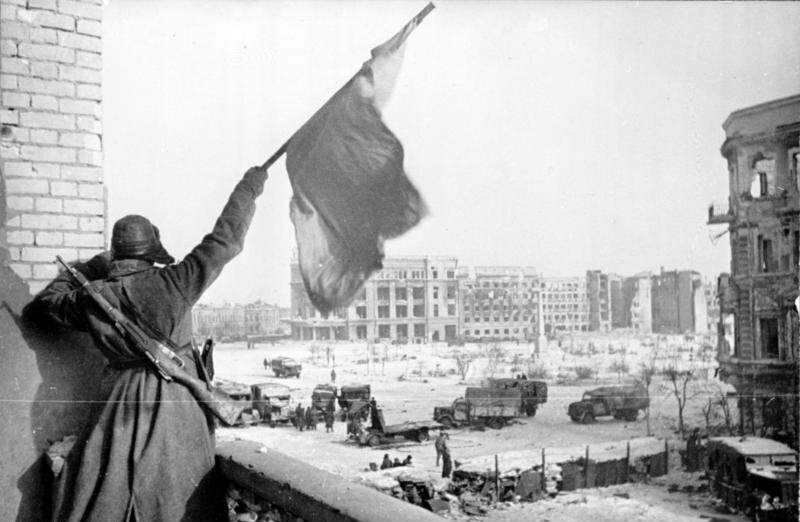 The tide of war was turned in Stalingrad with the surrender of General Paulus’ army. To them, the war won before the first Allied troops ever departed the English coast. Facts are on their side. With or without the Second Front, Hitler would not have been able to resist the Red Army. 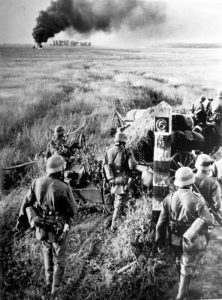 The Russians correctly assess that Roosevelt waited as long as possible to open the Second Front because he wanted to bleed Stalin and the USSR out as much as possible and only gave the go-ahead in June of 1944 because he knew that Hitler was defeated and worried that the USSR will take over Western Europe. Once again, it was Russia who saved the day. Once again, it received no credit. This was becoming a pattern. This pattern of the West amassing sufficient forces to challenge Russian sovereignty in its own land has been engraved on the Russian consciousness by the two patriotic wars. In their view, NATO’s expansion into Eastern Europe, the Baltics, and now the Balkans, falls into that pattern. Many Russians see in the insertion of Vladimir Lenin exactly 100 years ago into Russia from his exile in Switzerland via a sealed German railroad car a blatant attempt to destabilize and destroy the Russian Empire; an attempt that actually succeeded. Many Russian historians see Roosevelt’s hand in financing, via international banks, the major Nazi military expansion of the 1930’s precisely to threaten and eventually destroy the Soviet Union. To these Russians John McCain and Lindsey Graham are simply the latest link in a long chain of Westerners hell-bent on destroying Russia as a major player on the stage of history. This view of world history is not without merit and can be argued among historians. What is indisputable is that it is in fact Russia’s view and that two attempts to dominate Russia over the past 150 years have spectacularly failed.